display now at or near Habitat for the Arts. 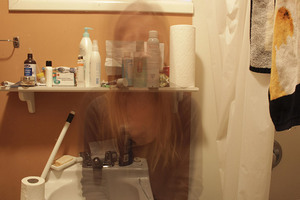 Exposure to everyday chemicals can make photographer Marie LeBlanc sick. Even the tiniest amount of perfume, hairspray or pesticide in the air can trigger symptoms like burning eyes, headaches and skin rashes. But the artist said fresh, clean air eases her daily struggle, and when she breathed Jasper’s “pristine” air was inspired to share her message. LeBlanc suffers from Multiple Chemical Sensitivity, a little-known but complex chronic condition affecting about three per cent of Canadians. She said: “Fresh air is good for everyone but for people like us it’s what we are struggling for. We are searching for clean air and the air here, wow. “It’s less pain, my head is clearer. When you’re in a building overexposed to certain things it affects your pain level and the way you think. In fresh air it’s a little bit better. LeBlanc, who lives outside Edmonton, has photographs on display at the entrance to Jasper’s Habitat for the Arts. Her art focuses on environmental illnesses and sensitivities, and toxic environments.